Located on the north bank of the Fox River, the former Fox River Mills is an aggregation of three old paper mill buildings. On the National Register of Historic Places, the brick buildings date from 1883 through 1915. Two of the buildings served as paper converting plants as late as 1985. The buildings are located just two blocks from College Avenue, a short walk to shopping, the Performing Art Center, fine dining, churches, the library, and Lawrence University. Being located on the Fox River allows you to enjoy the sight and sounds of the river. The courtyards provide an opportunity for sunning and entertainment in a spectacular and unique setting. 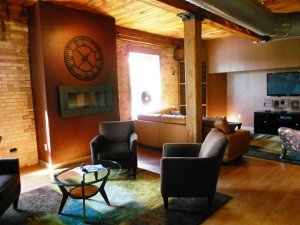 Our resident community space is filled with natural sunlight from the south facing windows with spectacular views of the Fox River. Relaxing in this space is like a day at the spa. Watch your favorite shows on our big screen TV or cozy up to the fireplace with your laptop and enjoy our WIFI. A spacious kitchen and dining area can accommodate your entertaining needs in outstanding surroundings. 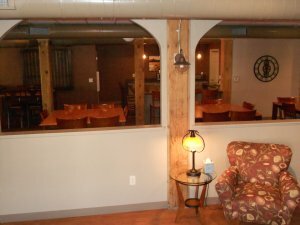 This area is available for our resident’s enjoyment or for residents to rent for private functions. 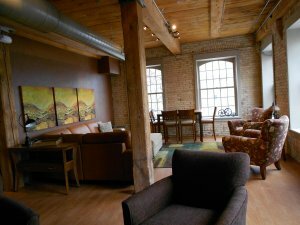 Living at the Historic Fox River Mills apartments offers you a totally unique living experience. We offer studios, one, two and three bedroom apartments. We also offer two, three and four level luxury townhouses. Some with panoramic views of floor plans to choose from. 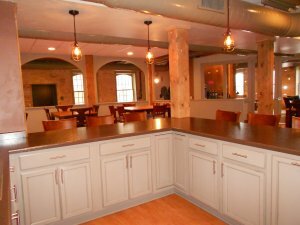 The building's restoration has retained it's outstanding historic features such as brick interiors and wood beam ceilings that can soar up to fourteen feet high.